Kathara Deftera, which means Clean Monday marks the beginning of Lent. It is a Public Holiday and it is celebrated all over Greece and Cyprus with picnics at the fields and mountains, where the tradition is to fly kites. In big cities, it is also celebrated in parks or nearby hills, or anywhere there is space for a picnic. Events and activities take place in all towns and villages which feature plenty of music, dancing and delicious Lenten food, (mostly vegan food) at the start of this Orthodox festival of fasting and contemplation. Saracosti, which is the great period of Lent before the Orthodox Easter takes its name from Tessaracoste (Quadragesimal), which comes from the word forty, which is the forty day period until Palm Sunday (actually six weeks) and then one more week until Easter day makes a total of 48 days of “fasting”. During this period we fast so that our bodies and spirits are “cleansed” to prepare for accepting the Resurrection. During Saracosti, no meat or dairy food are eaten. Lenten food, usually consists of vegetables, dried legumes and seafood, such as kalamari, octopus, shrimps, oysters, cuttlefish, mussels, lobsters etc. Fish is not allowed with the exception on two occasions: on the 25th of March (Annunciation of the Virgin Mary) and on Palm Sunday. Lagana is a flat bread with sesame seeds and it is made only on Clean Monday. Macedonian Halvas, is one of the main Lenten sweets, especially the variety made with tahini and sold in block or brick form. This type of halvas is sold by weight and comes plain, flavoured with chocolate, or studded with nuts and we love eating it for breakfast or sprinkled with lemon juice and cinnamon on top, as a dessert. Today I baked a Lagana (flatbread), prepared Dolmades Yialantzi, meaning fake dolmades as they are without the ground meat and are therefore vegan, Taramosalata, which is a dip made with fish roe, Htapodi Salata (an Octopus and Potato Salad ), Eliopitakia (small olive pies) and a crunchy bean salad, with the famous beans from Feneos, Corinth, which you will find below. For dessert, I made Halvas, a semolina dessert cooked in a pot. “Nistisimes Syntages” are the Lenten recipes the Orthodox can eat during fasting periods. "Nistisimes Syntages" are the Lenten recipes the Orthodox can eat during fasting periods. Another tradition on Clean Monday is kite-flying. Wherever you look up in the sky you will see thousands of kites. The kites were know in ancient Greece and we know that Archytas, who was a well known mechanic (4th century B.C.) used a kite in his aerodynamics. We also know this from ancient pottery and there is a scene on one depicting a young woman holding a kite. Of course paper was not known at the time but instead of paper they used cloth with which they made their sails. The tradition of flying a kite on Kathara Deftera is not coincidental. According to Greek Orthodox religion, the flying of the kite is symbolic. It symbolizes the flying of our soul towards God. Flying kites is a fun but not always easy. Without wind it is impossible to fly a kite and too much wind is also a problem. Have some person to hold the kite and walk downwind about 50 to 100 feet away from you. Have them hold the kite up in the air in front of them. Once the wind picks up, signal your friend to release the kite. As the kite gains altitude, pull on the line hand over hand until it is stable. Each part of Greece has its own traditions and some of the most unusual ones are that of Tyrnavos where all the inhabitants of the town of Tyrnavos gather in the region of the small church of Prophitis Elias to make the “bourani” soup. Bourani is a vegetarian soup with spinach, stinging nettles, and vinegar, which are boiled for lots of hours. During the preparation of bourani, people tease each other with phallic models and indecent language is used and provocative movements are made. It is said that this tradition has ancient roots and this custom has been strongly influenced by Bacchic rituals. In the past women were not allowed to attend but today there is no such problem and in fact many edible things such as ice creams, lollipops or even bread have the shape of a phallus. Large phallus feature all over the town and they even wear them on their heads as hats, on their nose with funny eye glasses etc. At Galaxidi fires are lit almost every night and the local carnival events culminate in the festivities of Clean Monday. After the end of the float parade, people have lunch together at home or in the countryside. Then, they go to the marketplace where they carry ashes and flour in bags and throw them not only at each other but also at unsuspecting passers-by. The coast is transformed into a battlefield very quickly. If you like beans as much as I do, make this Greek bean salad, with lots of vegetables for a great vegan meal. I used a type of small Greek beans called Fassolia-Vanilies Feneou, but if you cannot find these beans, you can subsitute them with white haricot beans, cannellini, navy beans etc. Feneos is an enchanting region on the mountains of Corinthia. At an altitude of 700m, the especially fertile ground, the abundant water and the perfect climate combine with traditional agriculture to offer us, since the beginning of the 20th century, the tasty beans of Feneos with their rich taste and aroma. This is a variety of the common bean produced in the municipality of Feneos in the Peloponnese. They have been grown in the area using traditional methods and experience passed down from one generation to the next since the end of the 19th century, when the waters of Lake Feneos drained away. They are small, white, shiny beans with a thin skin. The producers named these beans ‘Vanilies‘ to emphasise their flat white color and sweet flavour, reminiscent of vanilla. They are highly nutritious, a great source of protein, and have less fat and calories than other beans. They are very popular on the market due to their distinctive sweet taste and the fact that they can be cooked quickly without disintegrating. In Greek mythology, pulses were a reward from the goddess Demeter to the inhabitants of Feneos, who had offered her hospitality when she was searching for her abducted daughter Persephone. I named the salad crunchy, as most of the vegetables in this salad such as the carrots, cucumbers, radishes, onion and bell pepper, give a lovely crunch! 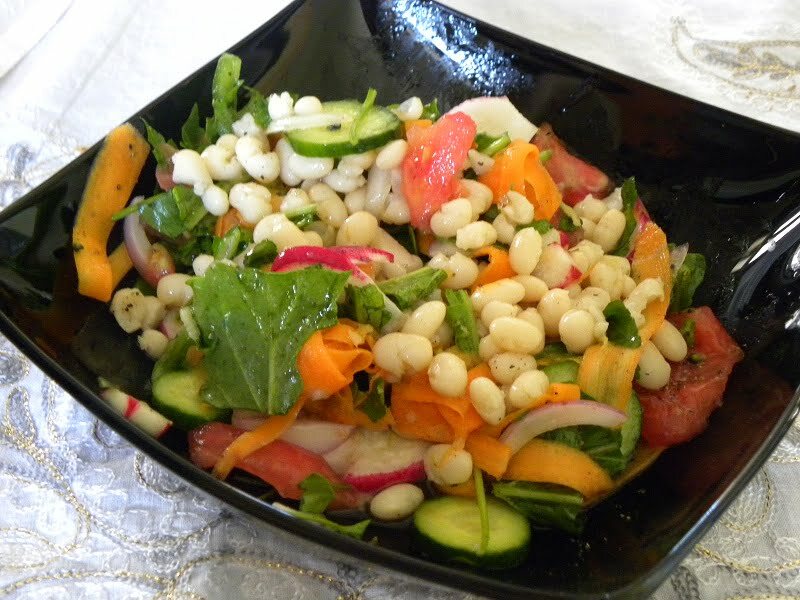 A lovely vegan bean salad with crunchy vegetables! Most of the vegetable in this salad give a lovely crunch, so more time is required for chewing them, making the meal very filling. Next day drain, add fresh water and boil. Remove froth with a slotted ladle. Drain, add fresh water to cover the beans and bring to a boil. Add salt, reduce heat and simmer for about 1 hour covered or until they become soft. When they are cooked put them under running water, drain them and refrigerate until ready to use. In a big bowl prepare all the salad ingredients. Add the beans as well as the ladolemono sauce, mix and serve. When I was younger I used t hate the foods of “nisteia”. You make them look really appetising Ivy. Will you be fasting the whole 50 days? Peter, it depends on what you were eating every day but imagine all those wonderful vegetarian dishes. I wish I could fast for all the lent period, not for religious reasons but it’s healthier once in a while to detoxicate from what we usually eat. Thanks Jenn, but I am not sure if it’s appropriate to wish the same to you. How fun that would be Rosie. Unfortunately the kids have grown up and we have stopped flying a kite. Wow Ivy, love to know about your traditions and this is a funny one!!!! Ι wrote that Maria, because that’s what the word gialantzi means. I have not made this up. Dearest Ivy, I hope that you have a blessed Lenten season. Thank you so much Cynthia and I hope the same for you. What a wonderful celebration, Ivy! I’m looking forward to your Lenten dishes! I also saw the roundup of closing Carnivali festivities and I had a good laugh with the Tirnavou pranks. Seafood and veges – now it sounds like I could actually make it through Lent. I’m looking forward to your posts on these dishes. Thank everybody for commenting. I’am sorry for not replying to each one of you or visiting your sites but I have some guests at home and do not have a lot of time to sit at the computer. Thanks for another fantastic post with Greek traditions. The beans salad sounds delicious!